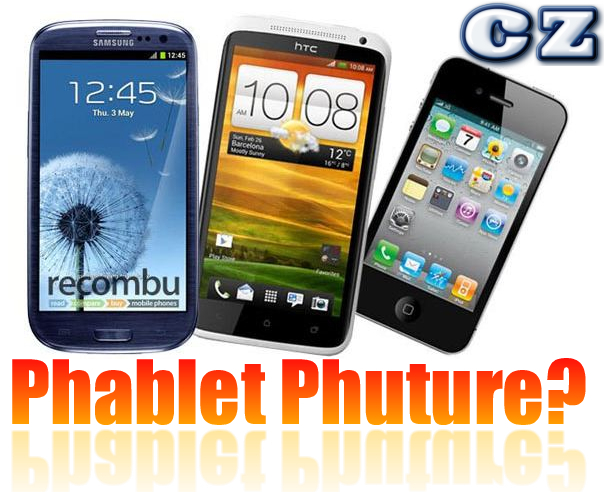 WILL THE PHABLET PHASE PHLARE UP WITH HTC ENTERING THE NICHE? Now this has to be the best rumor I have read this week... HTC is said to be entering into the phablet arena with their own jumbo 5" smartphone device. They just could not let Samsung rule the phablet roost without tossing their own version into the ring. This comes from the professional leak-artists over at Digitimes. They claim the HTC phablet will be 5" with pixel layout of 1794 x 1080 at 1080p HD. The new monstrosity is supposed to be announced in September or October of 2012. This might sound a bit far-fetched; but if you think about it for a while, it follows the pattern. HTC has gone blow-to-blow with Samsung for the past year in cranking out similar smartphone devices. They've done a great job, too. I happen to be of the opinion that Samsung takes the slight edge over HTC with their devices, but HTC certainly pushes the limits in making what I believe to be one of the best product lines on the market. People didn't predict a tremendous success for the Samsung Galaxy Note 1, and I think everyone is surprised at how solidly this unit has been selling over the past several months. Sure, it's not breaking records, but it has had respectable sales and has proven the phablet to be a strong enough niche to take seriously. That's why I think this rumor will turn out to be fact. HTC is not going to sit back and let Samsung exploit a potential strong niche without providing a competing product. I'm just wondering which one will spec out in the lead between the Samsung Galaxy Note 2 and the HTC "Behemoth" phablet-to-come. One thing is for sure, however... I don't see Apple jumping into this fight ever. Theyr'e still stuck in the 4"-or-less smartphone display size paradigm, and the best possible related product would be their iPad Mini (IF it even comes to fruition). Share your thoughts! Are phablets the next strong gadget niche, or will it pass in the night?